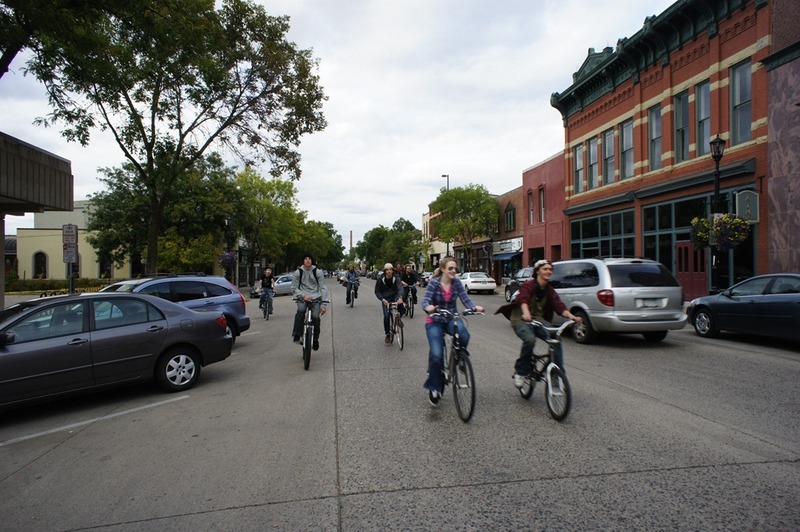 While downtown is the heart of Northfield, riding bicycles there can be a challenge for many people who are not comfortable riding with traffic in the middle of the street, especially on Division St, the 4th St. bridge, and Water St. on the west side of the Cannon River. The legal alternative – riding close to parallel or diagonally parked on the narrow streets—can be scary for many, as it’s difficult to anticipate when a door might be opened in your path or when a car that’s backing out of its parking spot might force you to swerve out into traffic. The illegal alternative—riding on the sidewalks, is dangerous for pedestrians. One possible solution is to paint sharrows on these streets and then conduct public awareness events and campaigns to get both drivers and bicyclists acclimated. [the symbol consists] of a bicycle symbol with two chevron markings above the bicycle [‘share’ plus ‘arrow’ = sharrow]. See this blog post (with a photo) by Reuben Collins, “a Traffic Engineer, Transportation Planner, and Cycling Enthusiast living in Minneapolis, MN” about how some bicyclists disregard sharrows. When riding I operate under the assumption that streets and roads can be used by cyclists unless prohibited by signage. Isn’t this the case? It seems to me that ‘sharrows’ have the consequence of giving the impression that cyclists need permission to use a street or road as a vehicle equal in status to any other. Good point; bikes are allowed on all MN roads and streets unless expressly prohibited. Bicycles are defined as vehicles. However, the law also states that the bikes should be on the right side of the roadway or in a designated bike lane. 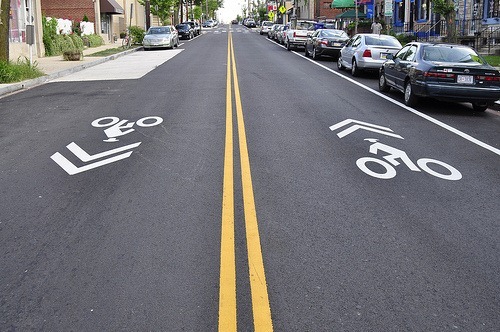 By placing sharrows in a specific street, the city would be allowing bicycles to use the lane. I looked up the law. It says ‘as close as practicable’ to the right edge of the roadway except when ‘reasonably necessary’ to avoid fixed and moving objects, vehicles, pedestrians, road hazards, narrow lanes and animals. So bikers have a right to be in the center lane of the streets Griff mentioned, sharrow or no sharrow. 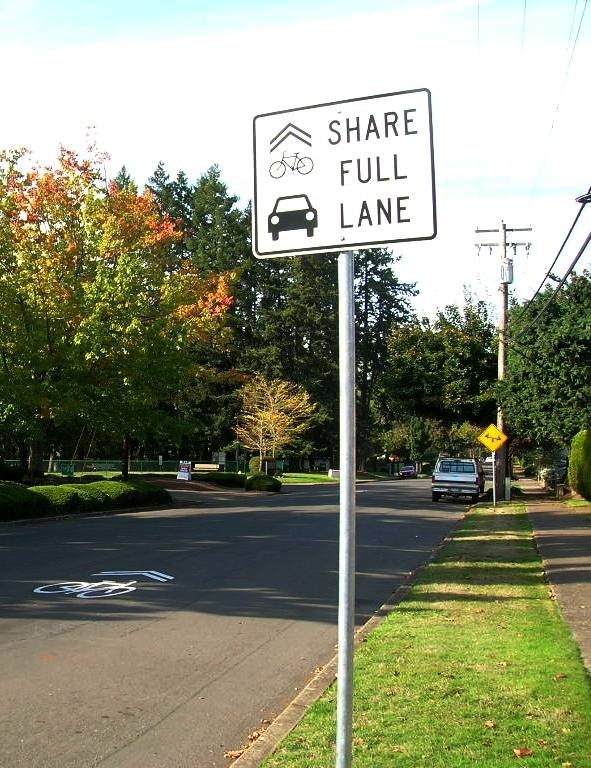 Every lane on every street or road (except if specifically prohibited) is a shared lane. I would much prefer money be spent on education as to this fact, rather than on signage and lane markers that give the opposite impression. William, you’re right, educating the public is key, which is why I think having public awareness events would be important… and fun. But I think using paint and maybe signs is important, as it’s a constant visual cue to both drivers and bicyclists that a behavior change on both their parts is needed. And more important, it’ll convey to everyone who has been reluctant to ride on these streets at all that it’s now practical and relatively safe to do so, especially those who continue to ride on the sidewalks downtown. 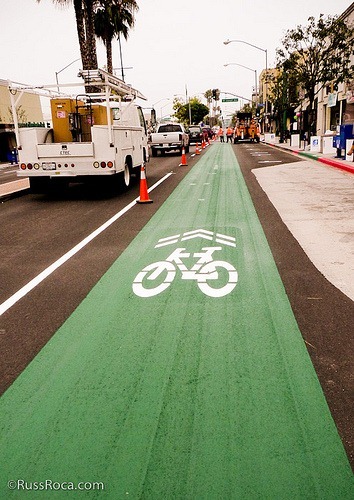 Anyway… soon every once serene city street and country highway will be visually polluted with traffic signs, stenciled paint sharrows, and painted bike lane markers- ‘cues’ that the road is safe for cyclists. All to the inevitable (unintended?) consequence that what once was allowed if not prohibited, will become prohibited unless allowed. 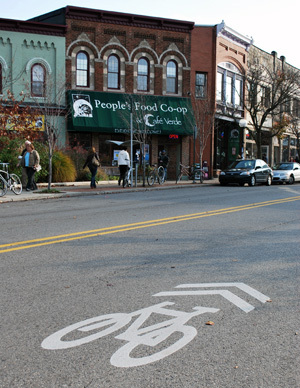 Sharrows are a good reminder, but don’t forget the art of it all. Have a contest for the best sculpture using a bicycle. I have seen many fun and interesting examples such as a bike that becomes the lower part of a sink and towel stand, a rider made entirely of flowers on a bike and so on. Perhaps a bike as a weather vane might catch the eye and mind. Then, have the sculptures made a permanent part of the landscape or cityscape. If the City does paint sharrows, I think we need to find out whether the sharrows are more effective if they’re in the middle of the lane or slightly to the right. Looking at this photo with the biker riding too far to the right makes me think that the sharrow should be more centered. The picture seems to illustrate that incompetent bike riders are incompetent, sharrow or no sharrow. Competent cyclists already know they have a right, if not an obligation, to be at least 3 feet from parked cars. Likewise, competent car drivers, like the one in the picture, know they should be 3 feet from a biker. Incompetent, aggressive, belligerent car and truck drivers will never change their behavior because of a sharrow with no enforcement policy to back it up. So, for little real benefit to anyone, our historic downtown streets should be ‘tagged’ with institutional graffiti? On the other hand, I’m a believer in adult education, and I think that an outreach program that accompanies the stencilling will encourage cyclists to ride in the center of the lane where there are sharrows and help auto drivers as well. I think a lot of adults haven’t heard of any changes to driving (and cycling) rules since Driver’s Ed — and that was quite a few years back for many. A must view site, this will really bring the mind up to a great awareness of bikes! What you have posted seems completely consistent with the direction we have been pursuing as a City, consider Jefferson as an example. Betsey is our resident complete streets guru-goto, and I’ll be interested to hear her response. But for myself, I’d like to see us explore this approach not only in the downtown but on all the City’s major and collector streets. Our pavement markings are done by contract, so to go this route, so to speak, we would only have to explore how much it would cost the contractor for paint and labor – -which can be easily done. Perhaps we could consider trying it out somewhere, perhaps in the downtown, to assess its effectivenesss. But it seems completely consistent with what the Council has wanted to do to this point – – so i think its great. Joe’s response re: sharrows follows below. Thanks for introducing this concept into our conversation. I stumbled upon the sharrows concept a few weeks ago while (re)searching for information that might be pertinent to the Complete Streets Policy discussions. I find this pavement marking has been used in numerous places around the world, and it is already officially recognized by the Manual of Uniform traffic Control Devices (MUTCD). Section 9 is entitled Traffic Control For Bicycle Facilities, and interestingly enough, its detail is included on the bottom of page 9C-10. I have attached that scanned detail for your ready reference. I am intrigued by the idea, and will do more research. Thank you, Suzie, for the input, and for getting Joe’s views. I’m looking forward to this as it goes forward. I think, for clarification, your statement ‘consider Jefferson as an example’ must refer to the Jefferson Road striping, stencils, and “share the road” signage, and you didn’t mean Jefferson Parkway (ever try riding down that with the semi behind you?)! George, yes, Suzie was referring to Jefferson Road, not Parkway. I took a look at the downtown streetscape last night. It is very pleasing to look up and down Division from the corner of 4th. The street has a historic look- kind of an old concrete type pavement unmarked by lane markers. It ties together the look of the historic buildings, in fact it is integral to the visual nature of ‘Historic Downtown Northfield’ that the city and its citizens have tried so hard to preserve (and exploit). It seems counterproductive to diminish this quality by stencil painting huge white bikes every 50 feet or so on both sides of the street. I urge anyone who is interested in this issue to stand on that corner and imagine these stencils marking the street, and then ask yourself if they would enhance the historic nature of our downtown. And if sharrows do indeed significantly increase bicycling downtown, then I think that would be a ‘public space’ enhancement to the downtown historic that would far outweigh the pavement markings. Griff…you quote: “A shared-lane marking or sharrow is a street marking… placed in the center of a travel lane to indicate that a bicyclist may use the full lane…” Does this not give the distinct impression that if there is no sharrow, a bicyclist may NOT use the full lane? And you say that the legal alternative for riding downtown is to ride close to parked cars and that can be ‘scary’ . No wonder it is scary…it is not the legal alternative. The legal alternative is to avoid a possible accident by proceeding safely in the middle of the lane. I’ll submit that what is scary is asserting the cyclist’s right to use the streets safely. I get it: The sharrow provides the permission that some cyclists need. Whether it will continue to do so after a rider is cursed and honked at, sharrow or no sharrow, remains to be seen. Why is it that cyclists feel they have a right to little more than ‘feel-good’ street markings and signs indicating what they already have the legal right to do? In my opinion the answer is simple: Arrogance. Are there pedestrian stencils indicating that walkers may be crossing the street in the middle of the block, or entering the lane to get into their car? (There are a heck of a lot more folks doing this downtown than are riding bikes). Are there motorcycle stencils for those riders who don’t feel comfortable riding close to parked cars? How about a mo-ped friendly stencil? Or a golf cart stencil for those who get around like that. Fat chance that any of these folks will get a stencil. But bicyclists, and/or their lobby, believe in the superiority of their mode of transportation and that it deserves special consideration. They have convinced the public sector that, regardless of cost, whatever visual pollution they propose is automatically worthwhile because biking is ‘better’. But it is not automatically worthwhile. Witness Jefferson Road. So much visual pollution for so little effect. William, I’m generally an arrogant person, so you got that right! But I’m also trying to solve two problems here: how do we A) keep bicyclists off the sidewalks downtown? B) get more people using their bikes for trips to and around Division St destinations? The ordinance and the ‘no biking’ signs and stencils on the sidewalks downtown have only been marginally effective, IMHO. So I’m proposing something relatively cheap and easy: paint and public education. Griff, regarding issue A), how about something not just cheap but actually revenue-raising: ticket the offenders. Griff… I guess we all have that exaggerated sense of one’s own importance…’generally’. I would propose a ‘no sharrows downtown’ proposal. Sharrows are not intended to keep bikers off the sidewalks. Give them tickets, impound the bike, speak sweetly…whatever. I see a few kids on the sidewalks downtown with bikes, skateboards, rollerskates, etc. I don’t see many adults barreling down the sidewalks upending the citizenry. Kids are known to do this sort of thing, much to the consternation of old fogeys. Plenty of people ride down Division everyday. More and more, as I see it. Once safety requires it, they move out into the center of the lane. More will do the same as the observe people biking safely on this stretch. We don’t need street graffiti in our historic downtown to encourage more people to bike Division…it is happening already. A sharrow will not help people too timid to assert their legal right to bike safely…witness the rider in the picture you supplied riding inside of the sharrow (and risking her life) to avoid a honk from behind. William, you’d be surprised how many adults ride their bikes on the sidewalks downtown, both with their kids and by themselves. Here’s one I blogged about a few years ago. * Sharrows increased the distance of cyclists to parked cars by 8 inches. * Sharrows caused an increase of over 2 feet in the distance between cyclists and passing vehicles. * Sharrows significantly reduced the number of sidewalk riders by 35%. * Sharrows significantly reduced the number of wrong-way riders by 80%. Griff…Ok this study shows they work in San Francisco…Another study from Gainsville FL, shows they resulted in riders moving over a few inches. These cities of course are 20 to 50 times bigger than Northfield. Interestingly the study showed no change in belligerent motorist behavior. Sean characterizes the effectiveness of sharrows on a busy street in Minneapolis as “hopeless”, but goes on to say that we should try it in Northfield. But negatively impacting the visual environment is a real risk of any project. I would just like the effect increased visual clutter to be considered before bringing out the paint cans and stencils. What will be the reward? 10 more people biking on Division every day? 5? 20? Nobody knows. 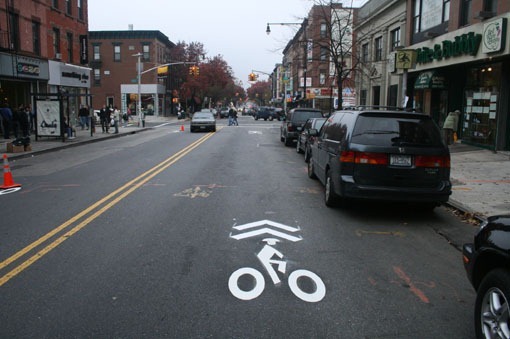 There was a statistically significant increase in the proportion of bicyclists riding in the street after placement of the ARROW. This shift from the sidewalk to the street should increase safety by putting cyclists where they are more visible to motorists and out of conflict with vehicles entering or exiting driveways that cross sidewalks, as well as reduce the conflicts with pedestrians. Barry…I got the info on the Gainsville study off the first couple pages of the SF study. Just used the same cherry picking language they used. A “few inches” is a “positive result” right? William, sorry, I didn’t reread Griff’s San Francisco study before criticizing your lack of a link. My apologies. This was primarily due to the low number of aggressive behaviors recorded in the “before” videotapes. In other words, the sample size — about a thousand observations before and another thousand after, with a total of 3 or 4 “hostile” acts altogether — was too small to draw any meaningful conclusion. So it’s not that the study showed there is no change, it only showed that one would need to use a much larger sample size to resolve the question. If there’s anything interesting to be said about the result, it’s that San Francisco motorists are surprisingly tolerant of bicyclists sharing the street. Finally, if one does read the actual Gainesville study, one gains some additional insight. Griff mentions that the San Franciso sharrows widened the average gap between bicyclists and passing vehicles by over 2 feet. The study itself says it went from 2’7″ to 4’10” (for the “chevron” sharrow design, 4’7″ for a “bike-in-box” design). The Gainesville study, on the other hand, found no significant change, but that may well be due to the size of the pre-sharrow gap: a full 6 feet. In sum, both studies found that sharrows decreased sidewalk and wrong-way biking by statistically significant amounts, and the San Francisco study found that they increased bicycle-to-car gaps by statistically significant amounts. Now it should be noted that “statistically significant” is a technical term, and it’s one that lends itself to misuse. Not everything that’s statistically significant is meaningful in the ordinary sense of “significant” as something one must pay attention to. The Gainesville study does a nice job of illustrating the difference, when it notes that the few inches increase in the bike-to-curb gap, while statistically significant, has little practical significance in terms of rider safety. So why, one might ask, does the San Francsisco report tout it as a “positive result”? It’s because the question being considered there is whether sharrows have an effect on bicyclists’ behavior, and the answer to that is a statistically significant Yes. There’s nothing cherry-picked about it. Ultimately one wishes to know whether sharrows are a cost-effective means of enhancing city transportation, where “cost” can be construed to include aesthetic aspects as well as easily measured expenses of paint and labor and the harder-to-quantify costs associated with Griff’s horde of unhelmeted cyclists being knocked to the pavement by increasingly belligerent drivers. Personally I find the chevron sharrow to be an appealing piece of iconography, and I am persuaded by the studies’ findings that they are worthwhile. I also think their sheer presence would, by simply being a constant reminder that bicycles are welcome on the city streets, encourage more people to do at least some of their downtown business by bike, but I should be quick to point out that that’s merely an impression based on little more than my own sense of my own (potential) reaction. As you say, albeit using different “anchor” numbers, whether you’d get 100 more people biking on Division, or 50, or 200, nobody knows. 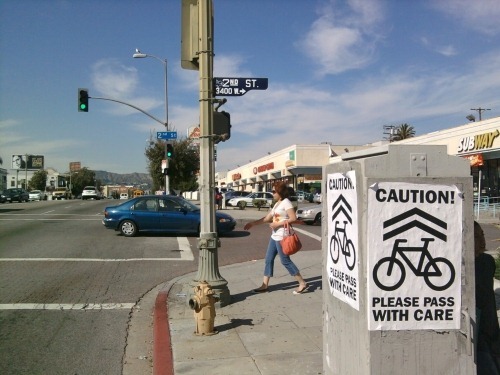 Sharrows can be used in a variety of situations, and it is assumed that increased use should increase motorist awareness of both bicycles in the traffic stream and the possibility of bicycles entering the traffic stream. Results indicate that sharrows increased operating space for bicyclists. Sharrows have reduced sidewalk riding not only in the current study but also in Gainesville, FL, as shown in a previous study. (4) Safety effects were apparent in variables related to the interactions between bicycles and motor vehicles. As communities continue to experiment with various uses of sharrows, it is recommended that researchers continue to create similar trials in other locations and traffic settings. Additionally, it is of utmost importance to evaluate and report those experiments so that more data can be examined to provide improved guidance to users. William, on rereading your original post here, it seems likely I misread your intent. It certainly sounded (to me) as if you were contrasting the San Francisco and Gainesville results. It occurs to me now (finally) that you were just summarizing a point made in the San Francisco study, namely that only one other study (at the time) had quantified the effectiveness of sharrows. So in my first post I managed to be negligent (in assuming you had a source you weren’t sharing), and in my second post I managed to be uncharitable (in assigning your words a negative spin even when you proclaimed them to be positive). It makes me wonder what I can accomplish with a third. Question: Are there enough bike racks downtown so that a person can ride to a central place, park their bike, and then continue to do their errands on foot (so riding neither in the angled parking street nor on the sidewalk) and then ride home , to work or school … whatever? Good to see sharrows being discussed. I’ve ridden the Bryant Ave bikeway in Minneapolis a number of times (busy-ish street, probably 3-4000 cars a day), which has sharrows and the green stripes. Unfortunately, it seems pretty hopeless. Less than 1/10 of the cyclists actually ride over the markings correctly. Most ride in the door zone of parked cars, and a few ride on the sidewalk. However, that’s not to say we shouldn’t try it on Division. I’m not concerned that it would severely impact the aesthetics of our downtown — at least, not any more than parking regulation signs, stop signs, and other street elements already in place. We should be trying extra hard to get cyclists to “take the lane” on Division, since it helps slow traffic to a desirable speed (15-20 mph). As for William’s comments, about sharrows. It is true it makes no legal difference, but even for someone like me (who doesn’t really mind being in drivers’ way on the road), it’s a significant reinforcement to see that my lane position validated every couple hundred feet. It reminds cyclists and cars that this behavior is okay — and again, I think that reminder is especially valuable on the street in Northfield that has the most on-street parking, pedestrian crossing, etc. A similar option is a BICYCLE MAY USE FULL LANE sign, but I prefer seeing the markings on the pavement. I just hope either option would be more effective on Division than they are on the Bryant bikeway. The city of Mankato has placed sharrows on some streets around the university. I hadn’t noticed them until yesterday afternoon. There are very few designated bike lanes around the university, but there are a lot of cyclists, so I’m glad they are doing what they can to create a safer environment for cyclists. I would like seeing sharrows on Washington. Actually, at 40′ wide with limited traffic and limited parking, it seems Washington would be a better candidate for lanes than sharrows. Division is where we need the focus though: there has long been talk about trying to “divert” bike traffic to Washington (including in the Parks/Trails master plan), but ultimately Division is where those bikeable destinations are. For the same reasons drivers and pedestrians want to be there, bicyclists want to be there — and we should make sure that’s as safe and comfortable as possible. Bicycles are vehicles and have all the rights and responsibilities as listed by law. Sharrows, lanes, paths what ever you want to call them are simply a means to restrict and confine bicycles to their “place”. I have yet to have an issue on my commute to work until I get close to Northfield where bicyclists are rapidly becoming second class citizens by their own choice. Park in central park and walk? Next thing you know my commute will be 3 miles shorter but I will have to park in Dundas and walk the rest of the way to work. And, from the aesthetic perspective- sharrows, lanes, and signs announcing the lanes, all diminish the visually pleasing nature of our streets. Just a matter of taste? I urge those who favor bike lanes and sharrows to take a look at 1st, 2nd and 3rd streets on the east side of town and compare it to 4th street. The first three streetscapes have a much different visual sense than does 4th street. Unlined and virtually unmarked the first three streets enhance the serene, almost idyllic, small town nature of the neighborhood. But turning onto 4th street is like turning onto a neighborhood bisected by a highway. Lanes and huge sharrows everywhere. And to what purpose? Is a biker safer on 4th street than on 3rd? There is hardly any automobile traffic on either street. We need to think long and hard about the visual impact of bike lanes and sharrows before we bring out the spray paint. 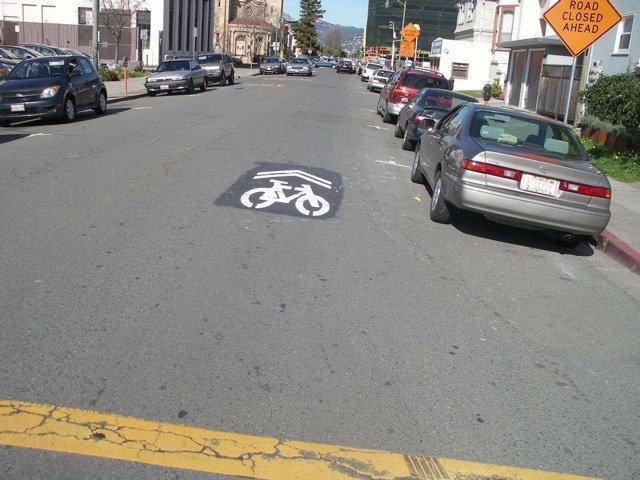 Quite simply, they’re not painting sharrows for you. Or for me. If you feel comfortable as it is, and ride correctly as it is, the paint makes no difference. I find Division Street a really pleasant place to ride, and feel fine “taking the lane” (as the sharrow would presumably direct me to do). But many people did not feel that way — I certainly didn’t when I started riding for transportation at age 15. E 4th St has 1000 cars a day. It’s not the best use of bike lanes, and local bikers have been highly critical of the lanes. Actual sharrows (and a narrower roadway) would have been preferable. However, Division Street has much more traffic than 4th at 6400 cars a day, and many many more parked cars. It’s a more intimidating environment, and calls for more guidance for bikers. And the presence of sharrows certainly needn’t make a street look like a highway: check out LaSalle Ave near Groveland Ave in Minneapolis. This is an attractive, historic area, and the “enhanced sharrows” don’t seem to detract at all. Would it be worth trying to get sharrows on Division St downtown yet this fall or be best to wait till spring? Best to wait until spring. Think it over and consider the consequences. For instance- Will the proliferation of sharrows lead to putting cyclists in their ‘place’? Or to a loss/reduction of legal remedy in the case of a cyclist getting hit by a car on an ‘unsharrowed’ street or road? Will sharrows give a false sense of security to new cyclists? Is the goal to have sharrows on every roadway that is legal for a cyclist to use? If so, that is a lot of sharrows. Might it be more cost effective to put ‘no biking’ stencils on the on-ramp of controlled access highways where cycling is illegal, and educate regarding cyclist rights on every other legal roadway? The items for motorists are already in law. The items for cyclists are already in law or are common sense. Finally, the ultimate in redundant regulation: We put down a stencil to remind people they need to act as if there is no stencil. There has got to be a better way! For the time-being, sharrows have no meaning in traffic law. The only effect they might have is to prove in court that a cyclist was riding in a reasonable and prudent position in the road. So long as they stick to their original intent, I think we’ll be fine: indicating shared space on roads that do not have adequate room for bike lanes, and that are high-traffic enough that cyclists do not naturally adopt a safe position. When we start sharrowing Fareway Drive or Mayflower Court, then sure, I’m on your side. But Division Street is truly a space that does intimidate new cyclists and may current direct them to unsafe behavior (riding on the sidewalk, or riding too close to parked cars). Hopefully sharrows would guide them to an appropriate position. But there’s only one way to find out for sure. Since, as I wrote above, painted sharrows will probably only last a year, it seems like the consequences are fairly low to giving them a try downtown. Sean…ok, let’s get Griff out with the spray cans next spring. Griff…Think Northfield needs more enforcement of cycling laws? Check out the film Premium Rush for a look at how bike messengers ignore the law in NYC. “Fixed Gear, Steel Frame, No Brakes”. Just curious…..what is the purpose of the signs and lines on the segment of Jefferson Road from Jefferson Parkway to Heritage Drive? Why so many repetitive signs and lines on that particular segment of road, with nothing on nearby Jefferson Parkway or segments of Jefferson Road north of Jefferson Pkwy or south of Heritage. Jefferson Parkway might warrant efforts to make it safe for bicyclists, especially as it is a key route to several schools and athletic venues. When the center boulevard with trees was added, the road became dangerously narrow for bicyclists. While bicycling on Jefferson Parkway, my husband was nearly hit by the side mirror of a truck. The road is too narrow, especially from Jefferson Road to Division Street. From age 8 to 21 I used my bike frequently for transportation and the best roads were those that were wide. If there was a parked car on a residential street, you just went around it. No special bike signs, no pictures on the road, no special lanes. I knew that I rode slower than motorized vehicles but I never thought it was my place to try to slow others down. There always seemed to be room for both bikes and cars & trucks. Why has Northfield been making roads narrower? It seems less safe. I agree with William Siemers regarding the aesthetic issues, and I’m not convinced of the value of lines and stenciled images on our streets. I was semi-involved in the Jefferson Road project, so I can provide some detail on that. what is the purpose of the signs and lines on the segment of Jefferson Road from Jefferson Parkway to Heritage Drive? The facility you see was a compromise that former councilor Kris Vohs came up with. There was significant interest in installing bike lanes on Jefferson Road, both to provide a solid alternative for bikes to Highway 3, and to help calm traffic on this road that sees a lot of speeding. The original proposal was to have bike lanes on both sides and eliminate parking from the road. Due to resistance from residents, the Council instead elected only to install a north side bike lane. Southbound bicyclists are invited to exercise their right to the travel lane (hence the “Share the road” signage), or use the parking lane if empty. Jefferson Parkway might warrant efforts to make it safe for bicyclists, especially as it is a key route to several schools and athletic venues. When the center boulevard with trees was added, the road became dangerously narrow for bicyclists. Narrow roads often calm traffic and allow bicyclists and motorists to travel safely in line. The road, in theory, does not need additional width if the motorist does not pass the bicyclist (this is very applicable on residential streets, where narrower is almost always safer). But I think everybody agrees that Jefferson was a sloppy implementation of this idea — at about 9000 cars a day, drivers have no patience for waiting their turn in line, and seek to pass even when unsafe. I don’t think anyone thinks Jefferson Road was more essential than the Parkway; it’s just that Jefferson Road was up for routine construction work before the Parkway. I have been passed unsafely many times on this road and agree it is very unsafe. Ultimately, a curb-separated cycletrack might be a great solution for this road, as it could accomodate schoolchildren as well as more experienced riders. From age 8 to 21 I used my bike frequently for transportation and the best roads were those that were wide. If there was a parked car on a residential street, you just went around it. It’s great that you had a good experience riding and that you were not in any accidents. However, nearly all cycling safety authorities discourage riding so far to the right that you need to change your position to get around a parked car. 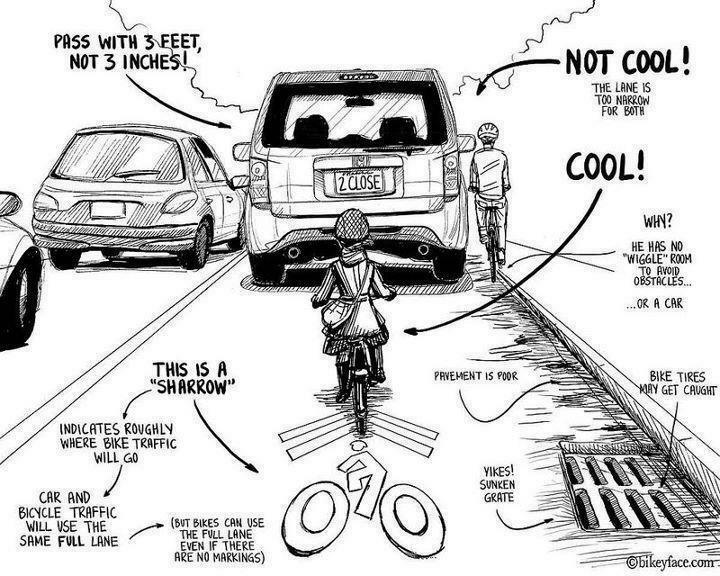 The most dangerous thing you do as a cyclist is entering the stream of traffic, not being in the stream of traffic. The usual recommendation is to ride about 5′ from parked cars (to ensure you don’t get “doored”). Riding so far to the right that you would have to swerve around a parked car also makes you less visible at intersections. Incidentally, getting people farther to the left, away from the curb and away from parked cars, would be a primary goal of installing sharrows on Division Street. This is a good resource on safe cycling on infrastructure not specifically designed for bikes (though I don’t agree with the whole site, the breakdown of risks is very helpful). Sean, thanks for your comments. There is an important difference between residential streets and busier collector streets. When I referred to riding a bike and going around a parked car, there was no “stream of traffic” because it was a lightly traveled residential street. It never seemed unsafe. I found this report from Australia interesting. The premiss is the cyclist is doing something wrong because she is in “dangerous traffic” and around “dangerous buses” , and “speeding automobiles”. The problem then is not with the cyclist it is with the motor vehicles. Let’s start taking care of that problem then. They should be ticketing those violations, reducing traffic speed etc. Jim, you forgot to provide a link to the report from Australia. Can you copy/paste the URL? Coming to a city near you, cyclists restricted in their travel as a result of pike lanes, paths…be careful what you ask for. Jim: Here is the link you wanted — you just weren’t providing text for the link itself. It’s a shameful choice for that City Council to make. And downright bizarre if you look at the road in question on a map. Looks like a two-lane rural road with almost no traffic, flat and straight. With a newly constructed bike path next to it. Seems sort of analogous to Armstrong Road in Northfield, though fortunately neither Dundas, Northfield, nor Rice County has seen fit to demand cyclists use the Mill Towns’ Trail instead of the roadway. One redeeming fact about this restriction, though: while one city may be restricting one street, many whole states already have these laws. (I believe most have been repealed, but at one time 20 or so required cyclists to use an adjacent path when available.) Minnesota does not require this, of course, and does not require cyclists to use bike lanes or shoulders, either. However, I don’t think this bolster the case against sharrows. Sharrows, properly installed, guide people toward proper vehicular cycling. They do exactly the opposite of what this Grimes council amendment does. I spent much of last Thursday touring the bike infrastructure around Minneapolis with a delegation from Utah led by QBP and Mpls bike officials. It was quite the eye-opener for me. Impressive. I think Northfield needs to revive its non-motorized transportation task force or some variation of it. See Bike Edina’s blog site and the blog post What is an Advisory Bike Lane? Mixed feelings on these lanes. I definitely do not like the installation on 14th St in Minneapolis, where the message seems to be for bikes to just chill in the door zone, where cars may or may not swerve. However, Wooddale apparently has almost no parked cars, and one side is adjacent to the curb anyway. I’m not sure about the effect on cycling, but at the very least, it should have a very positive traffic calming effect. All these disgruntled drivers fussing about head-on collisions don’t seem to realize that the point of traffic calming is to make them nervous. Making them nervous makes them better drivers. This road is very similar to Jefferson Road, by the way, a Municipal State Aid street getting 3000-5200 vehicles a day, with little-used parking on one side and no parking on the other. Advisory bike lanes might have been a good option for Jefferson; at the very least, it would eliminate the expectation that bikes should ride in the southbound parking lane. The drivers of Edina are not happy. “Ridiculous,” “odd,” “absurd” and “confusing and dangerous” are just a few of the descriptions irate drivers have used in e-mails to city officials about the weird bike lanes that have popped up around the city this fall. If Edina drivers think the lanes are unusual, they’re right. The city is believed to be just the second in North America, behind Minneapolis, to be experimenting with “advisory” bike lanes. Richfield will become the third next spring. 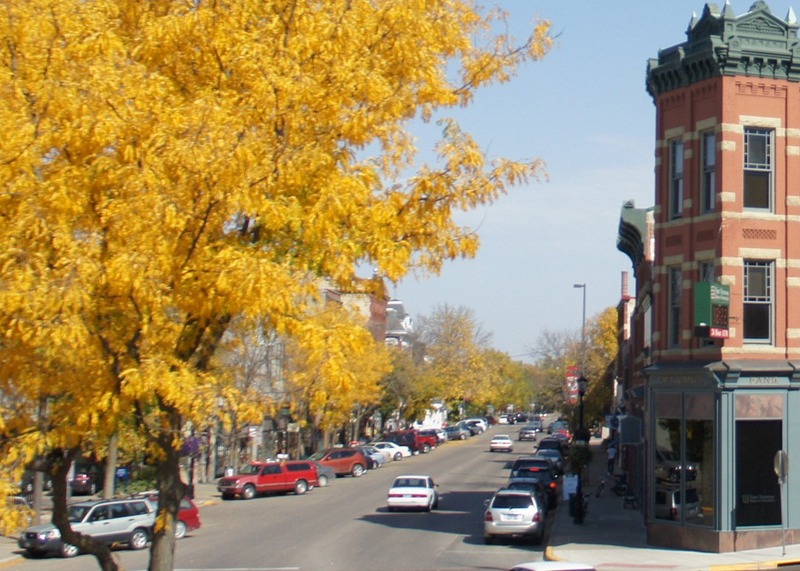 Parks & Rec Advisory Board member Dale Gehring has a blog post on Northfield Patch titled Connectivity in Northfield is at the Top of My Christmas List! Sharrows (a shared lane symbol painted on the road surface) may appear to be unsafe at first glance……however, I would argue they are safer than the alternative choices on Division Street. Sharrows on the street, signage, and public education would create a safer environment Downtown while also solving connectivity gaps. Sharrows. Shared Lane Usage discussion. A map was presented to the PRAB showing possible streets to pilot this program. The PRAB recommends that the Engineering Department study the use of sharrow lanes on 5th Street- Water to Washington, Division to 2nd-Down 2nd to the west end of the 2nd Street Bridge where it will meet with the Tiger Trail, as well as 5th Street from Division to Prairie as indicated on the attached map. Motion was made by D. Gehring and seconded by M. Miller. All in favor. Motion carried. Griff- Just from my personal experience, as I have approached Division from the west on 5th Street to make s right turn onto Division, I have had cars use the bike lane as a right-turn lane and pull right up beside me. It is a little disconcerting, to say the least, when I am checking traffic on my left, to suddenly have a car beside me on my right. For some reason, they evidently do not believe my right turn signal. Could you post the map of the possible streets for the pilot program? Ross, I saw the reference to the map but it’s not included in the packet. Maybe I can get PRAB member Dale Gehring to post it here since I think he was the one to introduce the issue at the meeting. Did the driver allow you to make your right turn before turning? I think the driver should have pulled up behind you, not next to you. After bike lanes started appearing in town, I asked a police officer if a motorist is supposed to stay in the traffic lane going into a right turn, or if one is supposed to ease towards the curb as I was taught in driver’s ed, which would mean crossing into the bike lane. I was told that a vehicle is to move towards the curb. John: It sounds like people are using the parking lane as a right-turn lane, to the right of the bike lane? I’ve never experienced it personally. As Nancy says, drivers are required to merge into a bike lane before turning right (in Minneapolis and St. Paul, bike lanes stripes are dashed to indicate where to merge). However, drivers are not required to go onto the shoulder or parking lane — and they should never use the shoulder, bike lane, or parking lane to overtake any vehicle, including a bike. So pulling up behind you in the bike lane is proper behavior. Trying to pass you on your right is not. Nancy & Sean- No, I was not able to make the turn first. The car to my right was in my turning arc. At that point of the intersection, from the center line, there is the right lane, the bike lane, and a no parking area next to the crosswalk. For a person to get to that point with a car ahead of them in the right lane, they would have to drive through the last two parking stalls. The other thing in this particular instance is that I had my right turn signal on, and had so from the alley. It appeared to me that the person was trying to ace me out at the stop sign, but I don’t want to project improper motives upon them without having been able to talk to them. The question I have is if we are supposed to move to the far right to make a turn at that intersection, then why are all the white lines painted on the street all the way up to the crosswalk? At surface value, it appears that these are there to accomodate bike traffic. If a driver can legally ignore the lane designations, then I think they have no value for traffic control. Seems like we have a teachable moment here. The bike lane should be used for the right turn according to the regs, if it is ‘free of approaching bicyclists’. By moving over, the driver frees up the lane to allow another car to move up to the stop sign. In this case, though, the second driver should have seen the turn signal on John’s car and respected his position to turn. The street that has baffled Edinans since it was re-striped last fall may get an easier-to-understand painting fix this spring. Wooddale Avenue, a primary north-south bike route, was striped with “advisory” bike lanes in September. The lanes, marked by a dashed white line and bike symbol, were installed from the intersection of W. 50th Street to Valley View Road. Drivers were supposed to drive in the “advisory” lanes unless a bicyclist was present. Then they were to yield to the cyclist and wait for oncoming traffic to pass before passing the bicyclist. Unceasing criticism and a barrage of e-mail complaints followed. Drivers complained that with no centerline on the road, they did not know where to drive. Some avoided the advisory lanes, creating possible head-on collisions with oncoming drivers. It did not help that one side of the road has a parking lane that some drivers expected traffic to move into; traffic is supposed to stay out of the parking lane. The City Council’s solution: Remove the advisory lanes, paint a centerline on the road, place a dedicated southbound bike lane on Wooddale from 50th to 56th Streets, and place “sharrows” — marked bike lanes that are intended to be shared by drivers and cyclists — on the rest of the road to Valley View. Long time no post on LoGroNo. But here is something to stir the bicycling pot, now that the weather might stay bike-conducive for a while. The author asserts, essentially, that rules written for “4000 pound” cars don’t work well for people on “20-pound” bikes, that the social goods of biking outweigh the occasional inconveniences bikers cause, that we need more dedicated bike lanes, not more laws, etc. As a sometimes biker and frequent (traffic) law-breaker, I mainly agree. What do others think? Paul, my apologies for the delay in replying. I’m going to use your comment for a new blog post. Soon! See my Storify story blog post on bike sharrows. I lived and worked in Chicago, Hyde Park, to be more precise, and I biked several times a week to my job. There I could use the street or sidewalk unimpeded, but there was very little vehicle or pedestrian traffic. It was great. Downtown Northfield, however, has quite a bit of traffic, unless you are coming off third street and over a block or two on a Tuesday afternoon between 2 and 3 PM. Hahaha. Then, there is the matter of visual congestion. There is just so much to see all around, a biker would really have to stand out with neon color and loud ah ooga horns. For me, there would just be too much traffic, too many unskilled drivers, and not enough importance for me to risk my life or limb. Paul…I like the link you provided: “Cyclists Should Never Be Fined”. The best idea in the article was that the ideal thoroughfare is two sidewalks next to a street, one for pedestrians and one for wheeled traffic. This is probably cost prohibitive as a retrofit. But perhaps a solution for particularly dangerous narrow streets that have sidewalks on both sides (Jefferson Parkway for example), would be to designate one side for cyclists. If you designated the sidewalk on one side of Jefferson Parkway for cyclists, and the other side for pedestrians, it would be less safe for Bridgewater students who walk to school. If the north side was for cyclists, children from Jefferson Square or Koester Court would have to cross Jefferson Pkwy without the crossing guard to get to the sidewalk on the south side. (The crossing guards are at the Raider Drive intersection near Bridgewater.) If the south side was for cyclists, children from homes on the south side (Roosevelt Dr, Eisenhower, townhomes across from Allina, etc. ), those children would have to cross Jefferson Pkwy without a crossing guard to get to the sidewalk on the north side of the street. A better solution might be to remove the center medians so that the road would not be so narrow. Painted lines could suffice for turning lanes. Jefferson has big wide boulevards to work with — currently, devoid of trees, life, or function. Here’s a good — if imperfect — example of a cycle track. Agreed, the ideal provision for biking is a lane that’s (i) reserved for bikes; and (ii) physically separated, even by a narrow concrete berm, from motorized traffic. Amsterdam and, IMO, especially Copenhagen are my poster children for this sort of thing. Here and to some extent here are links to various aspects of bike culture in Copenhagen. As William says, retrofitting for this sort of thing could be expensive. But such retrofitting could pay off not just indirectly (better health, reduced obesity, less pollution …) but also financially, in reduced infrastructural needs for motor vehicles. Downtown Copenhagen, for instance, appeared to this admittedly casual tourist to have, despite high population density, remarkably little extra car/truck traffic during rush hours. The Danes let their bike lanes and trains take the strain. The last type of bike facility being utilized more frequently is called a “sharrow.” It is a roadway with lanes too narrow for a motorist and bicycle to share side by side. Marked with a chevron symbol, it denotes that cyclists should control the entire lane by riding near its center. Motorists should respond as they would with any slower-moving vehicle; slow down as necessary, and pass in an alternate lane when it is safe and legal to do so. Learning to treat every roadway as a sharrow, when necessary, would be the ultimate solution to bicyclist safety. Sideswipes and near-misses don’t happen if the lane is properly shared and the cyclist doesn’t feel obligated to let the motorist “squeeze” by in the same space. The law does not require it. In an ideal world, bicycles would be considered and treated as equal road vehicles, and bicyclists would act and be treated as full and equal drivers of vehicles in traffic laws and policies. The need for expensive and separate bike facilities would be a thing of the past.